Two reccommended add-ons for your Firefox! 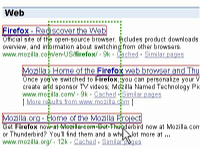 Snap Links allows users to easily open multiple links in new tabs by drawing a box around them. Links can also be opened in new windows, new tabs on a new window, copied to clipboard, bookmarked or downloaded. I mostly use it to (lazily) open multiple links into new tabs or as a replacement for a standard procedure: right click - open link in New Tab. Open this (Snap Links) and this (Linkification) if you are interested.